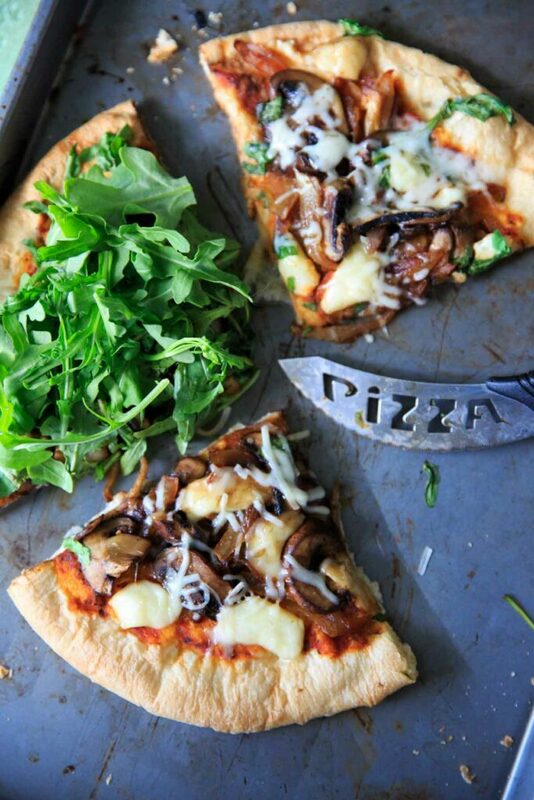 Upgrade your pizza night by making homemade pizza with caramelized onions, mushrooms, fresh baby arugula and brie cheese! 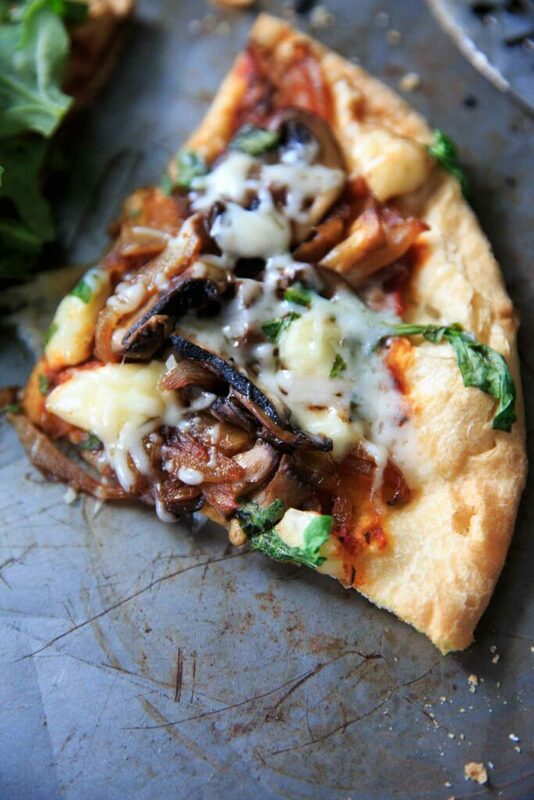 You’ll love this vegetarian pizza because it’s so flavorful, fresh and unique. A little bit of sweet along with a little bit of peppery flavors! Have you ever had brie cheese on pizza? Game changer! My pizza topping choices have been a little bit controversial in the past (pineapple, pimento cheese, pear, and of course there’s that honey drizzle). But I know there’s my people like you out there who can appreciate a unique pizza night. This idea was inspired by a place in Raleigh called Trophy Brewing Company. They call this the “Most Outgoing” pizza, perhaps because it’s the most bold and flavor-forward. There are always unique and creative dishes there and when I heard about the brie on pizza, I was only surprised that I had never tried it before! Also, since I did just learn how to caramelize onions it only seemed appropriate that I try this new combo. Sauce: I always like to add at least a dash of red sauce to my pizza (about 1/4 cup) because I love it, but you would be not be missing anything if you leave it off, with just a dash of olive oil in its place. Just be sure to not add too much sauce of any kind because it is already a pretty topping-heavy pizza. Caramelized onions: great for the added sweetness flavor. If don’t have time to caramelize them, you can add fresh slices of sweet onion instead. Cheese: Chunks of creamy brie, with the option for a sprinkle of shredded mozzarella too. Fresh baby arugula: Sometimes greens are added before a pizza is baked, but especially with arugula it will tend to burn if you do that. So I nice big handful of fresh baby leaves right before serving is perfect. The best arugula is just slightly peppery and will balance the sweet flavors perfectly! Drizzle of balsamic vinegar: or red wine vinegar, if you have either of those in your pantry. Optional but delicious add. 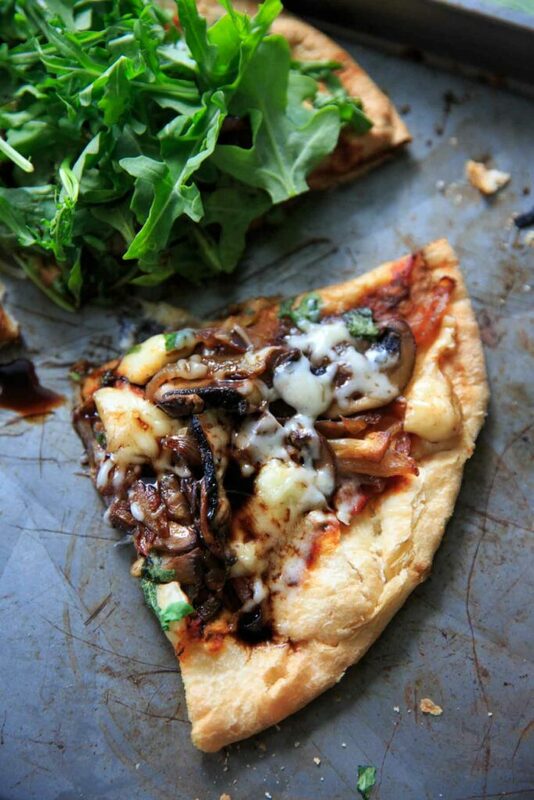 Upgrade your pizza night by making homemade pizza with caramelized onions, mushrooms, fresh baby arugula and brie cheese! 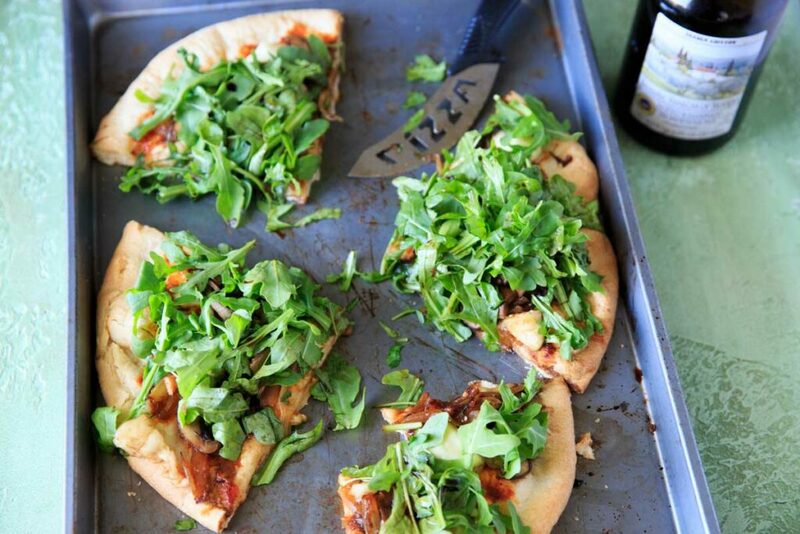 You'll love this vegetarian pizza because it's so flavorful, fresh and unique. A little bit of sweet along with a little bit of peppery flavors! If using homemade dough, roll out pizza dough to desired thickness and shape and place on a cookie sheet sprayed with nonstick oil. 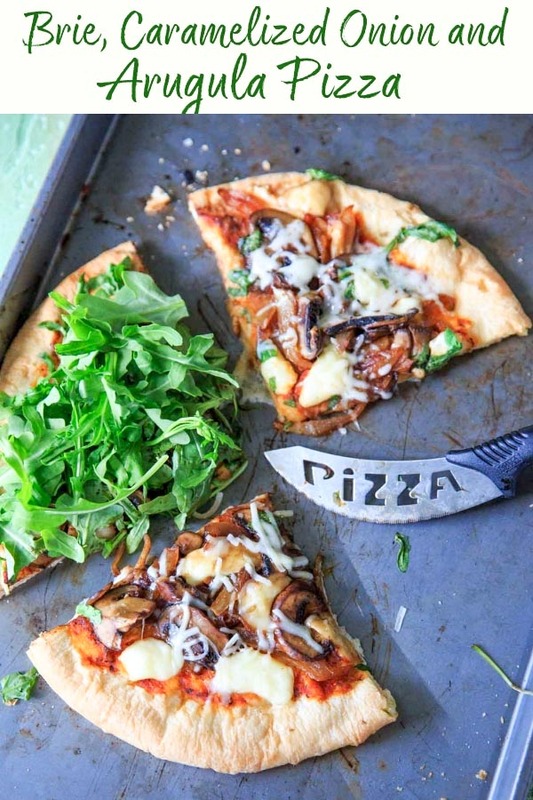 Pour the marinara sauce on and evenly coat the pizza dough with the back of a spoon or spatula. Add the onions, mushrooms, and brie cheese. Top with mozzarella. Bake at 425° for 12-15 minutes or until cheese is melted and crust is browned. 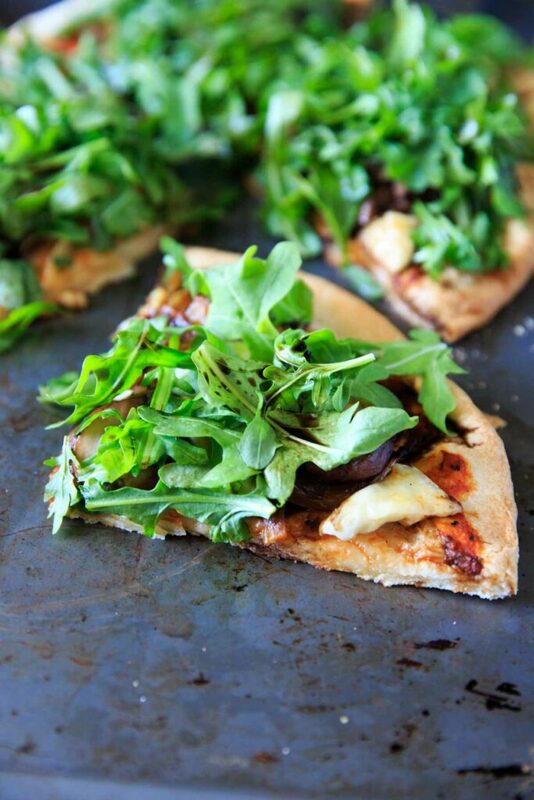 Top with arugula and drizzle with balsamic vinegar if using right before serving. Enjoy! Caramelized onions: great for the added sweetness flavor. If don't have time to caramelize them, you can add fresh slices of sweet onion instead.